School starts in a couple of weeks, so of course I want to squeeze a little quality time with the kids in a cramped car driving long distances on something we call a vacation. I can tell you the cramped car part is not the vacation. And it certainly doesn’t seem like a vacation when you look at the gas prices. No matter how thrifty you try to be on getting the cheapest, best discount, lowest fare, most inexpensive this or that, I realized I had little control over the price of gas. Cell phone advances have not only brought us GPS navigation which can be used in a car but it has also brought Apps that will guide you to the cheapest gas depending on where you are. And your phone knows exactly where you are. But regardless, gas prices are high at least compared to the 1970’s. Yes, I am that old. And no matter how much we say “abracadabra”, the prices do not go down. Oh, I am sure you have noticed like me, they go up a lot when a sheik sneezed in the Middle East then down a little when we say “Bless you”. Then up a lot more and down a little less and so on. It is a conspiracy. A conspiracy that has made us used to — or even expecting — ever increasing prices. But worse of all, we no longer say or do anything about them. Gas in my example is a metaphor for the necessities in everyone’s lives. The cost of food goes up and we can do nothing about it. Our salary stays the same. We get sick and have medical bills not covered by insurance but our salary is still the same. The only way we can battle this “price creep” is to have a built-in surplus or a regularly increasing income. Most of us have neither. So the other option is to reduce expenses. Some will try to shop more frugally or cut back on essentials. But unfortunately, for most the best decision is to reduce their debt load. And that is why bankruptcy is so common. Paycheck-to-paycheck is the norm — not the exception. 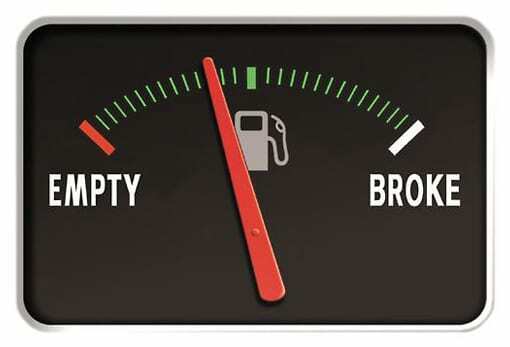 To give your finances a little gas you have to build in a surplus. Start saving a little extra. Pick up some extra income and definitely get rid of the draining debt load.